They called him “Tony C.” and even if you didn’t like the Red Sox you found yourself loving this guy. He was just a 19-year-old kid when Boston brought him straight up from the New York Penn League to start in the Red Sox outfield in 1964 and what a start it was. He was hitting .290 in August with 24 home runs before an injury ended his rookie season at 111 games. In ’65 he was even better, becoming the youngest player in history to lead the American League in home runs, when he smashed 32 in his sophomore season. By 1967, he had also become the youngest player in AL history to reach 100 career home runs and with him in right, Yaz in left and Reggie Smith playing center, the Red Sox outfield seemed set for a generation and was in fact leading Boston to the Impossible Dream of an AL Pennant. 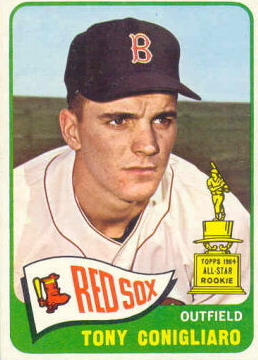 But on August 18th of that year in a game against the Angels, Conigliaro was hit in the face by a Jack Hamilton fastball and the path of both his career and his life were tragically redirected. I have not a doubt in my mind that if that pitch hadn’t been thrown, Conigliaro’s plaque would already be in Cooperstown and the Red Sox would have at least a couple more World Series trophies in the Fenway trophy case. Conigliaro valiantly tried to come back from the beaning but the affects of the pitch had been too physically devastating and he was out of baseball by 1971, though he made an abbreviated attempt at a comeback with Boston, in 1975. Then, instead of at least being able to enjoy his post baseball life, he suffered a stroke in 1982 while being driven to the airport by his younger brother and former Red Sox teammate Billy. He then lived in a vegetative state for the next eight years before finally passing in February of 1990 at the age of 45. What could have been.